The Shard is currently the tallest building in the European Union, standing just over 1000 feet high above London Bridge station. As one of the newest additions to London’s skyline, a viewing gallery was built-in covering the top floors of the structure. The gallery, known as ‘The View From The Shard’, offers spectacular views over the city and all of its notable landmarks. The shard has particularly good views of Tower Bridge, The Tower Of London, Canary Wharf and St Paul’s Cathedral. Look out also for the London Eye, The tower of Big Ben, the London Olympic Park and Greenwich. You really can see for miles and miles. We chose to visit at dusk to see London in both daylight and with its sparkling lights. As there are two viewing floors, at level 69 and 72, there was plenty of room but on occasion you needed to wait a while to get right up to the glass. Level 72 is partly open-air which gives the feeling that you’re almost outside. You can also see the way the panels of the building come together at the top. You will be given a hand-held multi-media information device which acts as your guide to what you can see. It also tells you some of the facts of the building and has informative videos about how it was built. On the decks themselves, look out for the digital viewing devices. They let you zoom in to particular locations and offer both real-time views and archived images. A nice touch here was that they have timers on to stop people hogging them for too long. There’s no doubt that the views are superb. You will never have seen London from this height before! Throw in a glass of champagne to make this a particularly enjoyable experience. The downside though is the glass itself. Your photos, especially at night, have reflections of what’s going on inside the viewing deck on them. They could have done with some ‘lens-holes’ every so often to get decent photos. 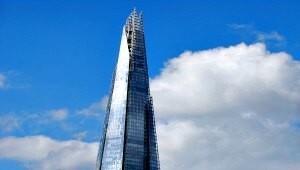 The Shard is located above London Bridge tube station, near to Borough Market and HMS Belfast on the River Thames.